I write cozy mysteries and light time travel books. The Frannie Shoemaker Campground Mysteries follow a group of retirees who camp together and sometimes stumble over dead bodies. Lynne McBriar's purchase of a vintage camper leads to trips back in time in The Time Travel Trailer series. And most recently, in the new Mystery Sisters series, Lil and Max are seventy-something sisters who tour the country in Max's red Studebaker, annoy their relatives, and solve murders. I love to hear from readers who have questions, suggestions, or experiences to share. Bats and Bones, The Blue Coyote, Peete and Repeat, The Lady of the Lake, and A Campy Christmas, as well as The Time Travel Trailer, Trailer on the Fly, and Trailer, Get Your Kicks! have all been selected as B.R.A.G. Medallion honorees. Their website is BRAGMedallion.com and is owned and operated by indieBRAG, LLC, a privately held organization that has brought together a large group of readers, both individuals and members of book clubs, located throughout the United States, Canada, and the European Union. My author Facebook page includes announcements on new books, special prices and giveaways, and sometimes time travel or camping jokes. Like this page to join the fun. Check out my recommendations and book deals. If you are a camper, you might want to follow my boards on Pinterest. The Frannie Shoemaker Mysteries and The Time Travel Trailer Series are available on many sites but all are available on Amazon. Check out my author page. 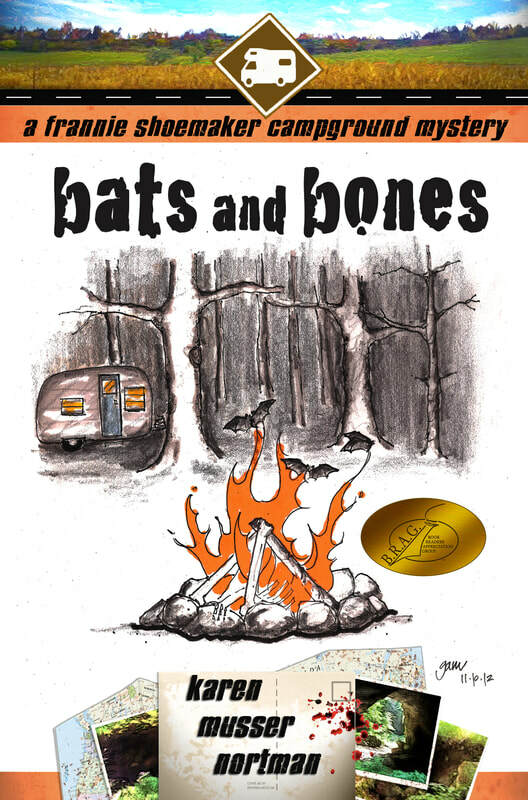 Bats and Bones, first in the Frannie Shoemaker Campground Mysteries, is an IndieBRAG Medallion honoree. Sign up for my Favorite Readers email list for occasional emails about my new books and special deals and get a free download of Bats and Bones. Use the button below. After you sign up, you will receive a confirmation email. Once you confirm, another email will give you the information to download the free book. Where did we go today? Are we there yet? Stories of our own camping adventures. Hopefully no dead bodies. Links to reviews and interviews.